In complete accord with the policies of the Adenauer government, which saw itself as the sole representative of Germany, West German athletic associations tried to establish their right to sole representation of Germany in the arena of sports. In 1951, the International Olympics Committee (IOC) recognized the Federal Republic's National Olympic Committee as the representative of Germany and simultaneously rejected the application of the GDR's National Olympic Committee. However, the situation changed in 1955, when the IOC "provisionally" recognized the GDR's National Olympic Committee on the condition that an all-German Olympic team be formed. From a Western point of view, an all-German team was preferable to an independent GDR team, if only as the lesser of two evils, and in 1956 all-German teams competed in the Winter Games in Cortina d'Ampezzo and the Summer Games in Melbourne. Despite political tensions – which found their most forceful expression in the Berlin Crisis of 1958 and the construction of the Berlin Wall in 1961 – all-German teams went on to compete in the Games of 1960 and 1964 as well. It was only in 1965 that the GDR National Olympic Committee was completely recognized by the IOC, and from that point on the GDR was able to send its own Olympic team. 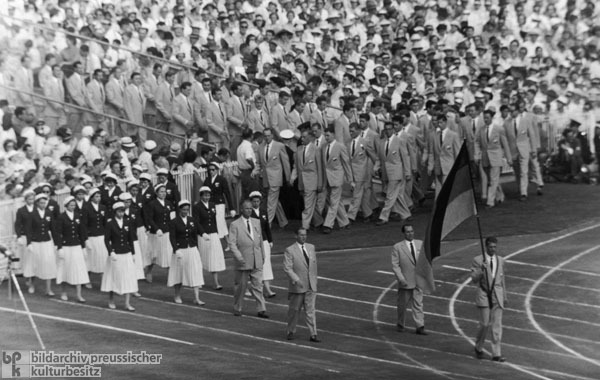 The picture shows the entrance of the all-German team during the opening ceremonies of the Olympic Summer Games in Melbourne on November 22, 1956. Karl-Friedrich Haas (FRG) carries the German flag; he is followed by Heinz Schöbel (at left, GDR) and Max Danz (at right, FRG); behind them is delegation head Gerhard Stöck (FRG). Photo by Hanns Hubmann.